I will try to find the data and post it in ShareGeo, but until then you might want to explore this dataset that shows death related to air pollution. I really need to get some happier datasets into ShareGeo! Following on from successful meetings In England and Wales, on 19th March I attended the inaugural “Scottish QGIS User Group” hosted at Stirling University. My first thought revolved around the level of interest that such a meeting would acquire, but as it turned out, it was very popular. I was also surprised at the geographical spread of the attendees, with several folks coming from Brighton (Lutra Consulting) and Southampton (Ordnance Survey) as well as all over Scotland & northern England. Although the attendees were dominated by public sector organisations. From my own perspective, the talks on developing QGIS and Cartography in QGIS were of particular interest – demonstrating the every growing potential of QGIS. Additionally, the improvements (particularly speed enhancements) that look to be coming soon (as highlighted in Martin Dobias’ presentation) are impressive. As for the user group itself, it will be interesting to see where it goes from here and what direction it will take. How will future events be funded? How often should the group meetup? What location? A recommendation from myself would be to have general presentations and talks in the morning, then in the afternoon split into different streams for beginners / users / developers. At the end of the meet-up (and a few geo-beers in the pub) there was definitely a sense that everybody got something out of the event and would like to attend more meetups in the future. A special mention of thanks needs to go out to Ross McDonald – @mixedbredie (Angus Council) for his efforts to organise the event and additionally thinkWhere (formally Forth Valley GIS) for sponsoring the event. As the search for missing Malaysian Airways Flight 370 approaches it’s 5th week, the reliance of Geospatial technology and the skills to analyse large volumes of data are becoming increasingly clear. In this post we will look at some of the geospatial technology and techniques that have been used in the search for Flight 370. Flight-370 disappeared on the 8th of March 2014 having left Kuala Lumpur en-route for Beijing. There was simply no trace of it. Communications were lost somewhere over the Gulf of Thailand. Speculation quickly rose as to the fate of the aircraft with hijack and rouge pilots being muted as possible explanations. A catastrophic break-up of the aircraft through an explosion was not ruled out but looked unlikely as this would generally be noticed. Furthermore, there was no sign of debris in the area of Flight 370 last known position. After a few days, data started turning up that suggested that the plane had stayed aloft for several hours after all communication was lost. Equipment onboard transmits information such as status updates and diagnostics. The engineering teams can then monitor the health and performance of components while they are in use. The engines had sent burst of data every hour and these had been picked up by a satellite operated by Inmarsat. By monitoring the Doppler effect in the received data, Inmarsat was able to chart 2 possible paths; one to the north and the other to the south. This had never been done before and the innovative use of this data by Inmarsat allowed the rescue effort to be concentrated in 2 distinct areas. After a bit of tweaking and refining, the Inmarsat scientists were able to discount the Northern corridor and the search re-focused on the Southern corridor, a vast expanse of ocean west of Australia with no suitable landing site. How they achieved this was really quite clever. They used “truthing data” from other aircraft to monitor the Doppler effect and therefore refine their estimates for Flight 370. They then calculated the speed and altitude of the aircraft and were able to work out roughly where it would have run out of fuel and ditched into the ocean. This greatly reduced the search area. GAOFEN-1 – a high-resolution optical sensor run by CNSA (Chinese National Space Administration) which was launched in April 2013. Gaofen-1 is equipped with a 2 metre resolution CCD (Charge-Coupled Device), an 8 metre resolution multi-spectral scanner and 16 meter resolution wide-field multi-spectral imager. It is difficult to tell which sensor produced the image below, but from the resolution it looks like it was the 8m res multi-spectral scanner. A French satellite operated by Airbus Defense and Space spotted 122 objects in a cluster. The objects were up to 23m in length and in a cluster. (image released by MOSTI). Airbus Defense and space have a host of satellites run through their Astrium including EnviSAT, CryoSAT, Copernicus, ELISA and Helios 2. Australian AP-3C Orion – Orion aircraft were deployed to likely search areas and scanned the area. It is likely that the crew were using a combination of electronic surveillance system and just their eyes. This might seem like old-school, but it is an effective method of verification as trained operators can discount or confirm sightings from remote sensing. The aircraft has a long-range and can fly low making it ideal for searching. Why has it taken so long to refine the search area? Well there are lots of satellites, but only a few of them would have had suitable sensors on-board. Data is collected and beamed back to a receiving centre. The raw data will most probably have to be processed before it can be used for anything. This takes time. The search area may well have been narrowed to a chunk of the southern Indian Ocean, but this still represents a huge area, not dissimilar to the size of Western Europe. Processing and analysing data for such a large area is not easy and will rely on a degree of automation followed by humba verification. The southern Ocean is a wild place with frequent storms. We can see from above the at optical sensors have been used and these will be unable to penetrate cloud cover. Scientists would have to wait for the satellite to pass over the same area to try and get a better, cloud-free image. The repeat cycle may be anything from 1 day to 10 days or more. Then you add in the ocean currents. Anything object floating in the ocean will not be static and could drift by 10’s of kilometres a day. Given that the plane is likely to have crashed 15 days previously, debris could be 100’s of kilometers from the crash site. That is, if it has not already broken up and sunk. But we can at least model the ocean currents and estimate the potential dispersal of the debris. The NY Times have some excellent visualisations of both the currents and the wave heights in the southern Indian Ocean during March. These have been produced by the National Oceanic and Atmospheric Administration and the National Centers for Environmental Prediction through remote sensing data, in-situ data (buoys) and models. 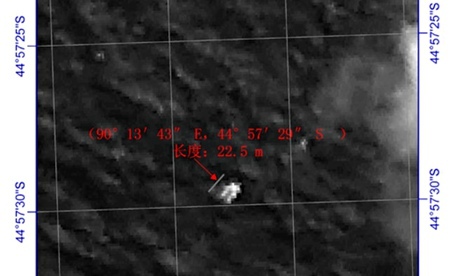 While never 100% accurate, they provide an indication and convey the uncertainty involved in determining a search area. Once a search area has been identified, the searchers are able to deploy listening devices which locate “pings” emitted by Flight 370’s black box. This is achieved by towing a listening device (TLP-25) back and forth across a wide area. Pings should be received periodically and the position and strength of these should triangulate the position of the black box. But the sea floor is not flat in this area. It is around 4500m deep with mountains up to 2500m high. We actually know very little about remote ocean sea beds. We have limited data collected by ships and most representations come from spaceborne remote sensing data. These are not very accurate and may “miss” large structures (1-2km high) such as seamounts. There is nice overview of ocean mapping on the BBC website. The difficulties of retrieving debris from deep, remote oceans was highlighted by the search for French Airlines flight 447. In this case, both black box transmitters failed. A Chinese ship detected a ping on the 5th April and a day later an Australian ship detected a ping. But the pings were quite far apart. The Australian ships detection seemed more consistent and stronger and this was backed up by more detections in the same area on the 8th. It is a slow process, but each detection should help reduce the uncertainty. The question is, will the batteries in the transponders last much longer? They are already at the limit of what is expected so time is running out. It is clear that remote sensing technology has been critical in every stage of the search for Flight 370. It will continue to be so until the plane is found. It has been used effectively to narrow search areas and discount blind alleys. It is also interesting to note how associated data has been used in ways that it was not intended to locate the plane and praise should be given to the Inmarsat scientists who came up with a novel solution when data and information was scarce. The search for Malaysian Airlines Flight 370 – a great article in the New York Times that focuses on the remote sensing data that is being used now that search teams have identified a “likely” crash site in the Southern Indian Ocean. I’m working on the development of a new linear buffer tool for the Digimap for Schools service. Linear buffering is a common feature in GIS applications. I came across 2 libraries that would offer this sort of functionality. One is JSTS andjsclipper the former being a port of the famous Java JTS Topology suite and the later being a port of the C++, C# and Delpi Clipper. I finally decided to go for jsclipper due to being unable to build a custom cut-down version of the huge JSTS library. Last week members of the COBWEB Project team attended the GEO-X Plenary and Geneva Ministerial Summit event in Geneva, Switzerland. GEO, the Group on Earth Observation, who have held annual plenary meetings since the organisation was established in 2005. GEO-X marked a particularly significant milestone with participants looking forward to the next 10 years of activity across GEO and GEOSS(the Global Earth Observation System of Systems) . COBWEB was therefore delighted to be invited to be part of the European Commission delegation at the GEO-X exhibition, and to be able to take up opportunities to give a Speakers Corner talk on the project, to speak at the Citizens’ Observatories side event, to speak at the AIP-6 Side Event, and to show posters at the OGC stand including both a poster and video which was shown in the European Commission Speakers Corner area. Chris Higgins talks about COBWEB during the Citizens Observatories side event. The project was well represented by members of the COBWEB team covering technical, organisational, stakeholder engagement and dissemination activities, which enabled very productive discussions and networking to take place throughout the week. COBWEB’s Architecture Implementation Pilot (AIP) -6 achievements in enabling single sign on access across the COBWEB access management federation triggered some great conversations for Andreas Matheus, Bart De Lathouwer and project coordinator Chris Higgins. This contribution to the wider GEO community was also acknowledged in a GEOSS showcase film shown as part of the Ministerial Summit. COBWEB’s development and infrastructure was highlighted in Chris Higgins’ talk during the Citizens Observatories side event, with a particular call made to our fellow Observatories’ to discuss and collaborate around interoperability across the projects. Meanwhile our stakeholder engagement work to date, including collaborations with organisations such as Dyfi Woodlands, was the focus of our Speakers Corner talk by Jamie Williams. Citizens Observatories emerged as a key consideration for future environmental policy making and the GEOSS representatives were keen to ensure interoperability and access to citizen science efforts in generating environmental data in the interests of local, regional and global efforts to ameliorate environmental impact. Citizens are key to the European Commission vision as articulated in HORIZON2020 and therefore the initial tranche of Citizen Observatory projects, of which COBWEB is one of five, are trailblazing the future shape of citizen involvement as stakeholder in environmental policy. The COBWEB project was present at the European Commission exhibition area through a shared stand with all of the Citizens’ Observatories projects: COBWEB,Citi-Sense, WeSenseIt, Omniscientis, and Citclops. Three collaborative posters were created especially for this space, outlining all of the projects in more detail and highlighting areas of commonality across the projects. We were excited to meet GEO Plenary participants and fellow exhibitors throughout the week – with over 89 GEO member nations present this was a truly diverse group. However, the highlight of the exhibition was the visit to the stand on Friday 17th January byJanez Potočnik, the European Commissioner for the Environment. The image at the top of this article (taken by Stuart Wrigley from the WeSenseIt project) shows Nicola Osborne, from the COBWEB project team, explaining all five Citizens Observatories projects to the Commissioner. For the team, the event also presented a wealth of opportunities to meet, learn from and exchange ideas with projects and organisations from across the world, and particularly to make connections to complementary activities funded by the European Union. It was a hugely useful week and we look forward to sharing more from the event, including our presentations, posters, and a brief video on the AIP-6 work showcased, over the following weeks. To find out about what COBWEB is and how EDINA is involved, please check out the COBWEB site. Spotted on the BBC News page, the recent flooding in the UK (yes, it has been even wetter than normal over here!) has prompted the UK Government to activate the global charter on space and natural disasters. This essentially gives government agencies access to the most up-to-date imagery of affected areas allowing them to plan relief and contingencies. There is no end in sight for the bad weather which is being driven by a very strong jet-stream. This has resulted in a number of deep depressions passing over the UK battering the coasts and dropping lots of precipitation. Depressions are not unusual at this time of year, but the frequency and intensity has given the rivers little time to recover before the next assault. It’s that time of year again. Finding the perfect gift for those that we care about and trying to be just a little bit different or going that extra mile to get a gift that really will be cherished. Increasingly, us map geeks have a host of carto related gifts that we can buy each other. This post highlights some of them and will hopefully stand as a bit of inspiration for anyone who wants to treat a geo-geek who has been particularly good this year. 1. 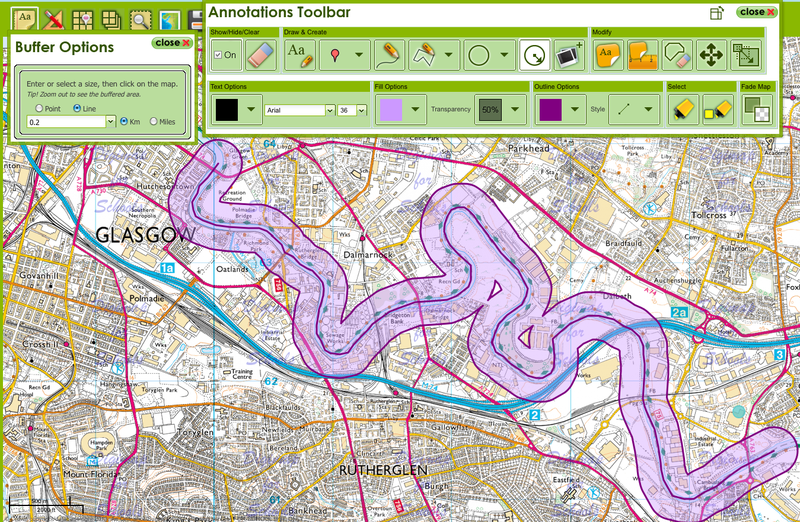 SplashMaps – SplashMaps are REAL outdoor maps designed for clarity and accuracy. They are Washable, Wearable, All-Weather Fabric maps. Prices are about £20 for a standard sheet and bit more for a custom Make-a-Map sheet. Note that Make-a-Map maps cannot be delivered before Christmas. Please choose the Map voucher for an even more personalised gift. There is a useful image showing the availability of standard maps that would be delivered by christmas. 2. Escape maps– Available through many sellers on ebay are genuine WW2 escape maps. These tend to be printed on silk and were issued to service men, generally RAF, when they were on missions behind enemy lines. The maps were light and easy to hide in clothing but gave service men routes to escape back to allied territory. I may have bought one last year and it is beautiful! Buy one and you will own a little piece of history. Prices vary, but around £25. 3. Jerrys Map – If you don’t know what Jerry’s map is, then please look at this video. You can buy tiles from the map, these are copies of the original, but as the map is constantly evolving you actually end up with something that is unique. Again, i may have already bought some tiles and they are amazing. If you happen to be in Edinburgh (perhaps over Hogmanay) then you can see the actual map which is on show at Summerhall. Tiles are available through Ebay direct from the man himself. Prices vary, but start at less than £5. 4. Bespoke map art– Yes, i know they featured last year, but they have expanded their range and there is something for every type of map geek. Prices range from 35 to over £50. Map Art – in this case a clock! 6. Animal World Map– This is a massive wall map of the World for kids. Each country is represented by the animals that are associated with it. Although the UK seems not to get any animals, just Big Ben. Surely we could have has sheep, salmon, a Highland Coo or a Haggis! Prices are £21 for an A3 copy and £26 for an A2 copy. 7. Typographic Maps– another “where art meets maps”, these typographic maps show several cities of the World (London, New York, Seattle…..) but features are represented just by their names. The A1 posters cost £26. 8. Map Bling– Jewellery with maps on it for him or her? Sorted. Prices from £15-£50. That’s your lot. What, no books i hear you say! Well i will put a list of some top map related books tomorrow.